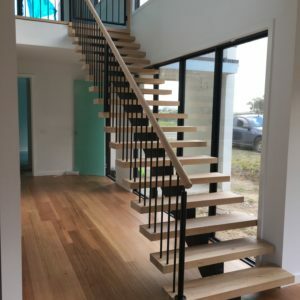 Steel Central Stringer Staircase with 66mm treads in Vic Ash. Balustrade consists of glass on patch fittings with a 50mm round stainless handrail. 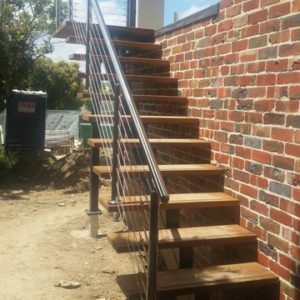 Balustrade consists of 60mm round handrail in select-grade Vic Ash with 38mm diameter black powdercoated posts with 16m diameter black powdercoated balusters. Steel central stringer staircase. Includes 42mm select-grade Vic Ash treads and landing with riser beads. 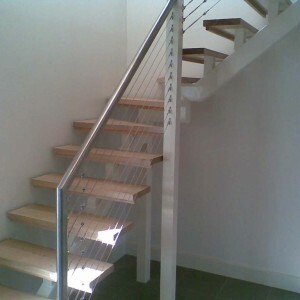 Balustrade consists of glass on stainless patch fittings with a 50mm round handrail to top of glass with glass clamps. 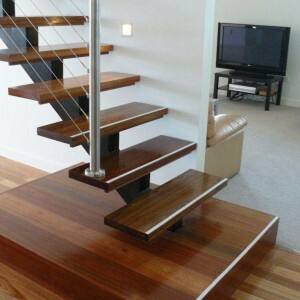 Steel central-stringer staircase with 42mm treads with riser beads and landing, in select-grade Spotted Gum. 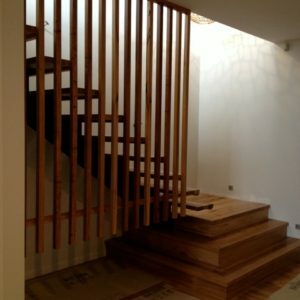 For the supply and installation of balustrade to 1 side of staircase. Balustrade consists of 50mm round mirror-like polished stainless posts and handrails with stainless wire infill. Steel central stringer staircase with 42mm treads with riser beads in Sydney Blue Gum. Includes a mitred returned landing. Timber balustrade consists of 45x45mm slats in Sydney Blue Gum. Steel Central Stringer Staircase with 66mm treads in Vic Ash covered in laminated Firestreak flooring. Balustrade consists of glass on patch fittings with a 50mm round stainless handrail. Steel central stringer staircase with 42mm treads with riser beads with raised bottom landing. Balustrade consists of stainless steel (brushed) 50mm round posts and handrail with stainless wire infill. The grey tape on the nosings was applied by the customer after installation to highlight the nosing edge. 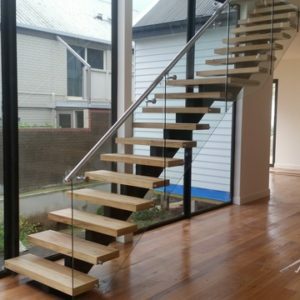 Steel central stringer staircase with 42mm treads with riser beads in Vic Ash. Includes a 3-step winder section. Balustrade consists of stainless steel (brushed) 50mm round posts and handrail with stainless wire infill. 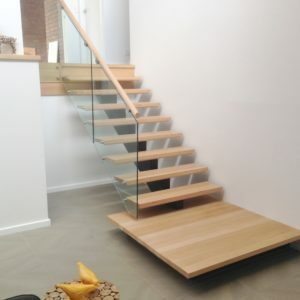 We are very happy with the end product at our place and are very thankful that we used Coastal Staircases. Kris, Jai, Chris and Ben did an outstanding job and it has really added another dimension to our home and the dogs are already a big fan of being able to get access from the rear of the house! The workmanship really is excellent and the time and effort by the guys to make sure it looks great is a testament to their skills, and Kris’ supervision and pride in the Company’s name and reputation. We would highly recommend Coastal Staircases.